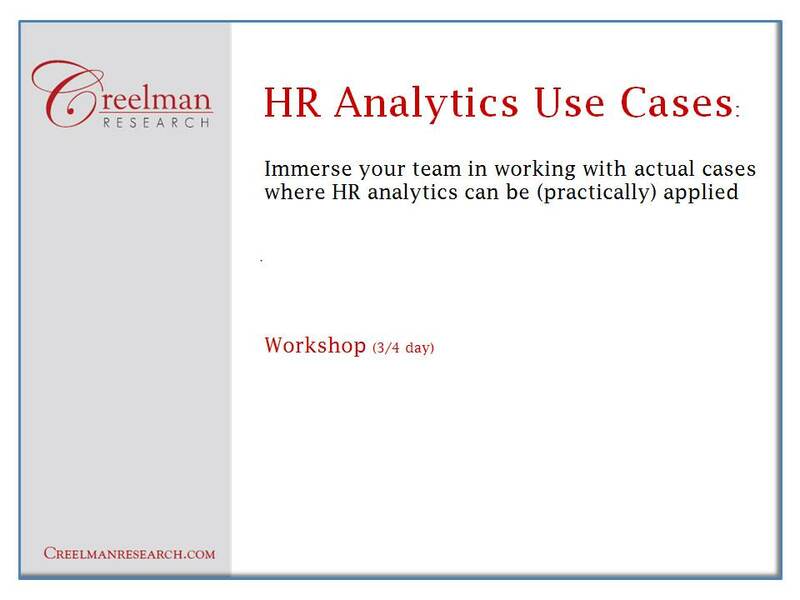 A great way to move your organization forward on HR analytics & evidence-based management is a workshop or micro-workshop. A micro-workshop lasts 1-2 hours, is normally delivered via a web platform, and addresses a specific problem in HR analytics that your team faces. HR analytics is a set of capabilities your organization develops over time and a series of micro-workshops focused on what your team needs, when they need it, can be a great way to keep things moving forward. Here is a common problem: Analysts produce data only to find that managers willfully disregard it. They seem to be eager to find excuses to ignore it. The investment in analytics is wasted because the results are not used. No matter how much your work at improving your technology and your analytical skills this lack of acceptance will undermine the program. If this lack of acceptance continues your HR analytics will be seen as unsuccessul. Our micro-workshop on Quality of Evidence / Acceptance of Evidence is a 2-hour program that can be delivered on its own or as part of a longer workshop. It is relevant to anyone who needs to persuade managers to pay attention to data. Need to chat about your own situation and whether this is relevant? Email dcreelman@creelmanresearch.com to schedule a call. HR leaders are embracing analytics, however the whole HR team needs to work together to bring more rigor to decision making—even the traditional HR “people-people” who do not have a quantitative background. Evidence-based management provides tools and a common language that helps both the analytics-people and people-people make better use of data in decision making. HR professionals often ‘get’ HR analytics and evidence-based decision making in theory, but struggle to see how they would actually use it in practice. This workshop walks through examples of common business issues and how HR analytics can realistically be used to support decision making in each case.